Is the Monster Energy Drink Better Than Soda? Energy drinks like Monster are popular, and some people are under the impression that they are healthier than soda. 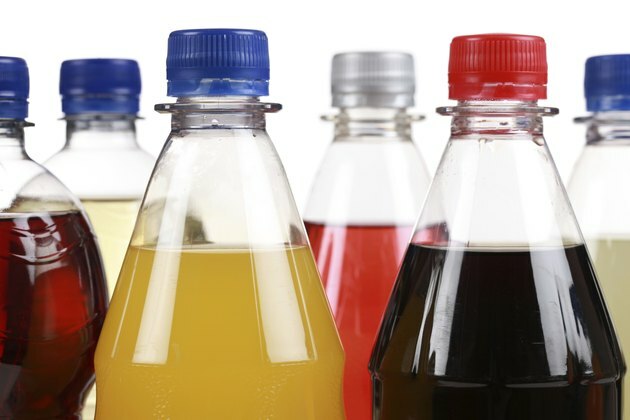 Both Monster and soda contain mainly sweeteners and water. However, Monster contains ingredients not found in soda. These ingredients may provide health benefits, but they may not be safe for some people. A 16-oz. can of Monster Energy contains 160 mg of caffeine, while Mountain Dew, one of the sodas with the highest caffeine levels, only contains 54 mg per 12-oz. can. When you look at a Monster can it is hard to tell just how much caffeine it contains because all that is listed is the amount of "energy blend," which contains caffeine and guarana, another source of caffeine, among other ingredients. Consuming too much caffeine can cause adverse effects, including trouble sleeping and high blood pressure. Unlike soda, Monster Energy also contains some vitamins, including 100 percent of the daily value for riboflavin, niacin, vitamin B-6 and vitamin B-12. If you drink a large amount of Monster Energy or if you take vitamin supplement containing these vitamins, you may get too much of them and experience toxicity symptoms. Monster Energy also contains small amounts of taurine, ginseng and guarana. Taurine is an amino acid that doesn't often cause side effects, but ginseng and guarana are herbal supplements that can cause adverse effects in some people. If you have high blood pressure, kidney disease, heart problems, an anxiety or nervous disorder or an overactive thyroid, you shouldn't consume guarana, which is very high in caffeine. Consuming ginseng may not be safe for you if you have heart problems or high blood pressure, schizophrenia, diabetes, an estrogen-sensitive health condition or a bleeding disorder. Neither soda nor Monster Energy drinks are healthy because they tend to be high in caffeine, calories and sugar, but most people can consume them in moderation. Follow the warning label on the Monster Energy cans and do not consume them if you are pregnant or sensitive to caffeine. Do not give them to children, and do not consume more than three cans per day. If you are watching your caloric intake, you can choose diet soda or low-cal Monster Energy. Is Diet Pop Bad for Kids?